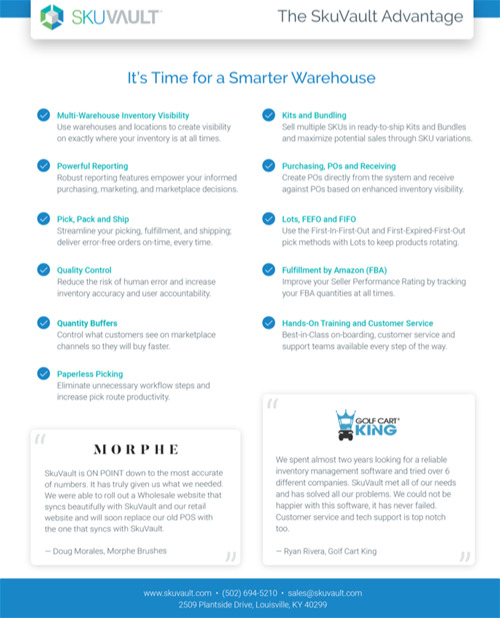 It's time for a smarter warehouse. SkuVault is an inventory and warehouse management software platform that empowers small and medium B2B and B2C companies with a focus in eCommerce. We provide a hands-on customer service experience, intelligent reporting, and automated warehouse and inventory processes that reduce waste and supply chain inefficiences. We sync your inventory across all of your selling channels and guilde you from purchasing to pick/pack/ship. SkuVault clients on average decrease their out of stocks by 10x, reduce labor costs by 30%, and reduce fulfillment time by 87%.